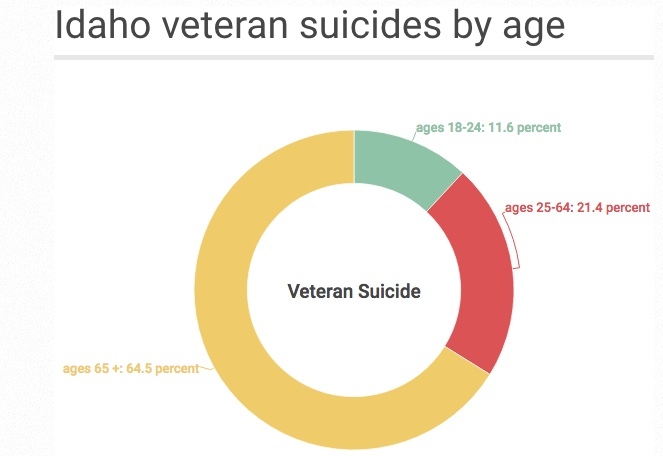 In Washington, more than half of those veterans who committed suicide were over the age of 65, while in Idaho, it was a full 65 percent. 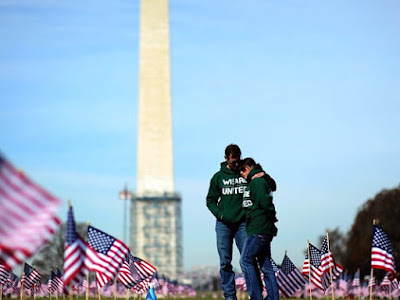 Iraq war veteran couple Colleen Ryan and Jeff Hensley set up 1,892 American flags on the National Mall on March 27, 2014. The veterans installed the flags to represent the 1,892 veterans and service members who committed suicide that year. Rates of veteran suicide vary widely by state. Certain factors that make someone more susceptible to suicide, things like being over the age of 45, in a rural area, American Indiana/Alaska Native or White, people from areas of higher poverty and lower education, and access to firearms. Many of those people can be found in the Northwest. In 2014, the state of Montana had the highest suicide rate in the country. Idaho came in as sixth, while Washington was farther down on the list.